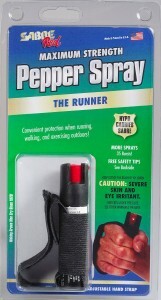 Pepper (OC) spray is one of the best personal protection products you can buy to defend yourself — whether from a dangerous drunk or a dog during your night run. This article will compare some of the most popular sprays available on the market today, so you can make right purchase for your personal safety. The world can be a dangerous and unpredictable place. It only takes one dangerous situation, no matter how rare, to have serious consequences on your health and safety. 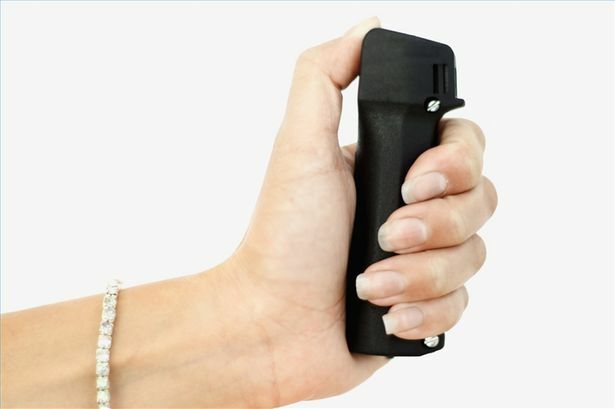 Pepper (OC) spray is an extremely effective non-lethal deterrent that will provide you (or your family) with the peace of mind you need. 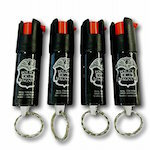 At about $10 a canister, it is also one of the most affordable self defense weapons on the market. It’s a small price to pay for a peace of mind. 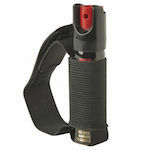 This article provides you with all the information you need to choose the best pepper spray for your self defense needs! 6 What is pepper (OC) spray? 7 Does pepper (OC) spray really work? What is pepper (OC) spray? The active ingredient in pepper (OC) spray is oleoresin capsaicin, which is the same chemical that gives spicy chilli peppers their sting. It is widely used by law enforcement agencies and military units when non-lethal force is required to subdue or restrain a subject. Since pepper OC-spray is legal in most states, it is available for civilian use for self defense against human attackers and also dogs, or bears (bear spray). Does pepper (OC) spray really work? In short — an emphatic YES. 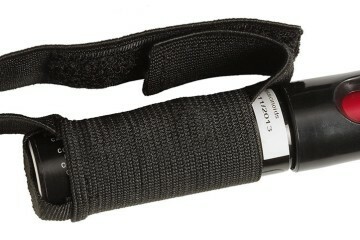 Remember, pepper OC-spray used by police and military forces, and is also readily available for civilian use. It is an effective defense tool. Getting hit by pepper (OC) spray is very, very, very painful, and the effects (burning sensation, swelling of eyelids, etc) lasts a long time. — over 20 minutes! It doesn’t matter how strong or big you are, OC spray has the same powerful effects! If you don’t believe me, check out this video where a girl gets to test out her spray on her boyfriend. Even though he is fairly big and strong, it doesn’t matter, as one shot is enough to have him crying like a baby for over 20 minutes. Final Verdict: You definitely do not want to be on the receiving end of an OC spray blast. Look for a spray that has at least 5+ shots in it — just in case you miss or have multiple threats. Many sprays on the market come in compact forms — on keyrings, “jogger” armbands, or even concealed in a lipstick. A spray for home use can come in a larger canister, sometimes even coming with a wall bracket. Make sure your spray is easy to operate. When you are in a high pressure situation you won’t have time to think about how to use your spray. 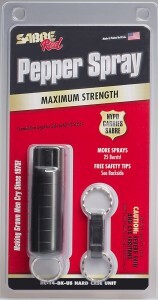 A typical pepper-spray canister will have a safety feature that prevents accidental discharge of the chemical — usually a slide or flip mechanism. Get comfortable with using your spray — practice with a spare canister. 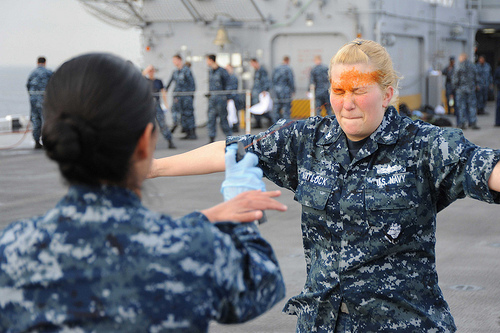 You want a chemical spray that hits hard — not some weak Taco Bell sauce. Look for maximum strength sprays, or sprays with at least 10% OC (oleoresin capsicum). Sprays come in either a fogger, stream, foam, or gel factor. Stick with the fogger, stream, or foam sprays as they do not require precise aim. If you are concerned about blowback or weather conditions (wind rain) then a gel spray might be for you. As previously mentioned, pepper spray contains oleoresin capsaicin (OC) and the percentage of OC will usually be printed somewhere on the cannister. Most of the time, you will see OC percentages range from about 2% to 15% — this tells you the OC concentration (by volume). However, this does not tell you the hotness and strength. For this, you will need to look at the Scoville rating. The Scoville Heat Units (SHU) rating is useful in determining the hotness of a spray — however there are some disadvantages. SHU measures the capsaicin content — the chemical that provides heat /burning sensation. The major capsaicinoid (MC) rating takes into account only the heat-bearing chemicals from peppers in their most concentrated form. 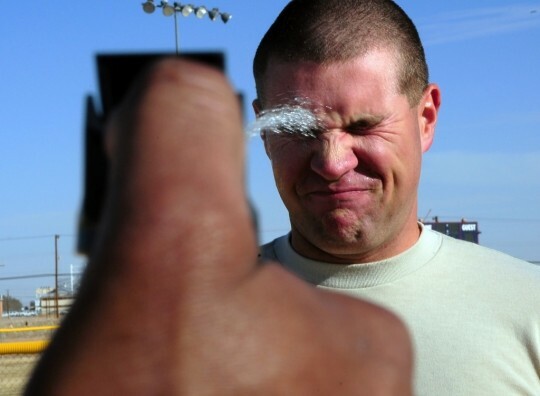 MC rating is usually the most reliable indicator of how strong or effective a spray will ultimately be when used on a human. 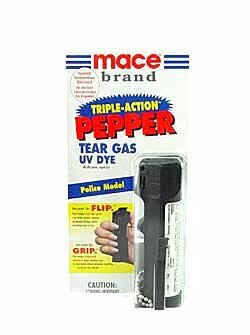 MC ratings can be measured in a laboratory and is very precisely tested to measure the heat of a pepper spray. Normally, MC ratings will range from 0.18% to 1.33%. The CRC rating tells you how much capsaicin and related capsaicinoids are included within the ingredients. Out of the 15 capsaicinoids in pepper only around 5 contain a considerable amount of heat. The CRC rating is reliable because it is regulated by the Environmental Protection Agency (EPA). Look for a CRC rating of 1% or higher. While these different heat ratings are nice know, most good brands of pepper spray will be more than strong enough to incapacitate any human threat. Don’t spend too much time agonizing over which spray has the highest heat ratings! BUY NOW! : SABRE-RED Police Strength Pepper-Spray-Compact, Black Case with Quick Release Key Ring & 25 shots, 5Xs more than the competition for max protection! The Sabre-Red Maximum Strength spray is one of the best compact personal protection products that you can buy on the market today. It’s formulation is very strong, similar to what is used by today’s police units. Though I have never had the opportunity to use it on an actual person, you can get an idea of how powerful it is by reading some of the funny stories of accidental discharge on the Amazon Reviews . What I like most about this spray is its compact form and quick release keyring action. I can carry this bad boy with me in my pocket easily, knowing that I can whip it out quickly if I ever encounter any dicey situations. This particular Sabre-Red spray has a 25 shot capacity which is very good for a canister of its size. To prevent accidental discharge of this spray, you need to slide a plastic tab on the top of the can to one side. This seems to work pretty well, but I would be careful. 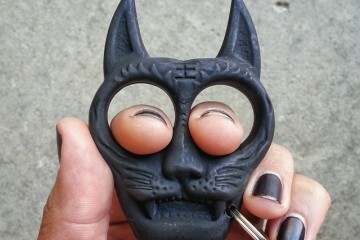 If this is bouncing around in my pocket all day, I am not 100% sure that I wouldn’t accidentally take of the safety and get a pocket full of nasty OC-spray! At a price of about $10 on Amazon, this is definitely a steal. It has a shelf life of 4 years which is really great compared to some other sprays on the market. 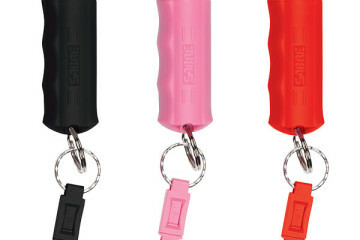 The Sabre Red Maximum Strength Compact spray comes in pink or black. Highly recommended. Start protecting yourself or your loved ones today! BUY NOW: SABRE-RED Police Strength Spray – Runner Model with Hand Strap & 35 shots, 5Xs more than the competition for max protection! If you like to go out for runs or bike rides, either at night or by yourself, then this self defense OC-spray is the perfect protection you need. It’s very convenient and light to carry with you — just strap it to your arm, no need to hold it in your hand during your entire run. 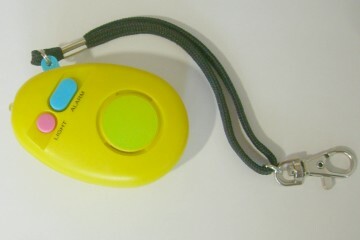 Many people have also found it useful when running in areas with loose dogs. The Sabre-Red Jogger has the stinging power that you can expect from a police-strenght formulation. It has a good 10 foot range and an exceptional 35 shot capacity. Note that this spray has a shelf life of 4 years, after which you will need to replace it. The Sabre-Red Jogger spray is easy to use. To discharge the spray, you simply need to slide the plastic tab on the top to release the safety, then press down with your thumb. Remember to test and practice with your pepper-spray regularly. At around 10$ per canister, this product is a no brainer for those who like to go out for jogs or bike rides. Usually you can find it the cheapest on Amazon.com, just be careful with the shipping restrictions to some states. It comes in pink or black. The Sabre-Red Family and Home Defense OC spray is the ultimate weapon in terms power and capacity. This heavy duty spray has an impressive 18 foot range and a fogger spread pattern that can fill an entire doorway. This simplifies the task of aiming immensely — one spray from this bad boy in the general direction of your attacker and he will be in a whole world of pain and blindness. The Sabre-Red Home Defense spray has a 35 shot capacity, which means it can handle multiple threats with ease. 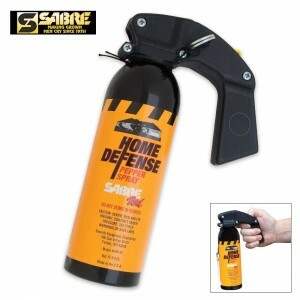 To use the Sabre-Red Family Defense spray, you simply need to remove the safety pin (similar to that of a fire extinguisher) and push the trigger. I think this is a really great and simple safety mechanism. Its intuitive design doesn’t really require any training to use, which is great when it is needed in an emergency. At about $35 a canister, it is more expensive than other OC sprays in the market. But considering how powerful this spray is, it is still quite a great value. This one spray will last you a long time — it has a shelf life of 4 years. 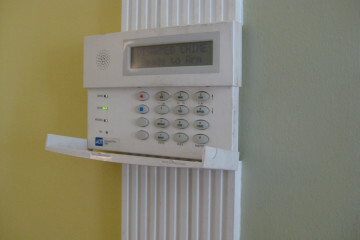 It comes with a wall mount bracket so you can put it in a permanent and convenient location in your home. You can also mount it to your bicycle if you want the ultimate defense while you cycle. If you want ultimate power and strength while defending your home or family, go and get the Sabre-Red Family and Home Defense Spray today! This bad boy is one cool looking non-lethal weapon that can pack the ultimate punch — at a distance! As a rule of thumb, the more distance you can put between you and the aggressor the better (in fact running away or staying away from risk situations is even better!). The spray comes out as a powerful stream that can easily hit a target 20 ft away. It also has a 10 shot capacity which is pretty good for a little compact device like this. It is a little pricier compared to other OC spray products on the market, however once you buy the gun you only need to buy replacement cartridges for future use. Carrying around this little guy in your pocket is certainly possible, but it is a little bit of a bulky shape. I can see this pepper pistol being a great home defense tool or something you leave in the glove box of your car. This will ensure that you will be prepared for almost anything life can throw at you! While this projectile explosion approach is unique, it has it’s drawbacks. The Kimber Blaster only has a two shot capacity, which means you better have damn good aim! The projectiles have quite a bit of a splash zone, but at 13 ft away, and under pressure, it would be nice to have more shots. Pepper (OC) spray is a super effective, affordable, and non-lethal self defense option for those who are looking for some peace of mind. Whether you buy a pepper (OC) spray for yourself or for your loved ones, remember to practice firing it regularly. Stick with reputable brands of pepper (OC) spray, stay away from sketchy no-name spray from ebay, don’t take chances with your safety. 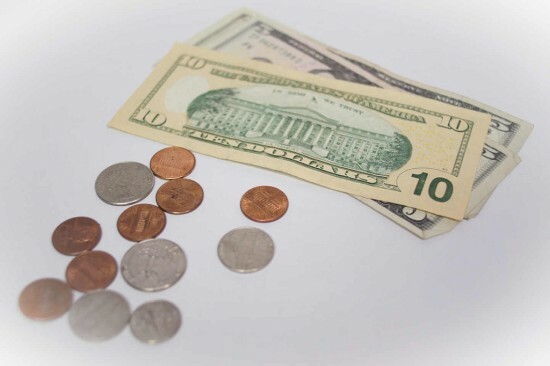 Consider buying several cans so you can put one in your bag, glove compartment, or bedside table. Another thing to mention is that it makes sense to carry a back up weapon. Sprays tend to work at a distance but in extremely close quarters it can be difficult to aim effectively. That’s why I like to recommend carrying stun guns as a back up. 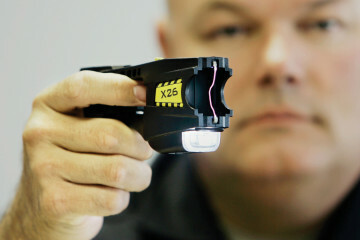 You can find our review of the best stun gun products in 2014 here. If you have any comments or suggestions about using or buying pepper (OC) sprays, feel free to put a comment down below. 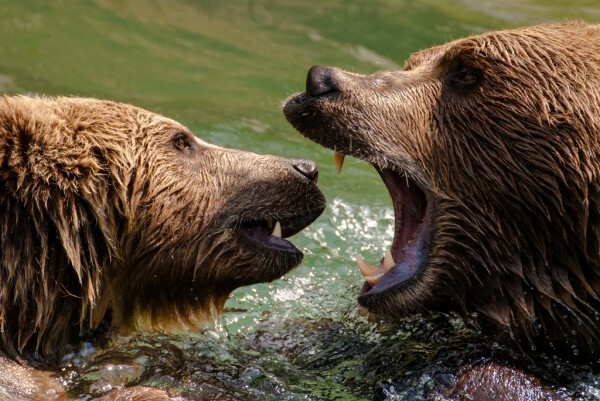 Bear Spray vs Pepper Spray: What’s the Difference? 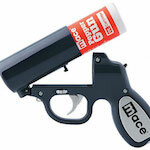 Mace vs Pepper Spray: What’s the difference between the two? The Self Defense Ninja brings you the best reviews and guides to using self defense weapons. 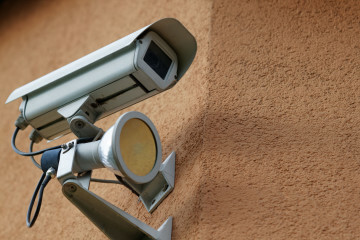 Safety, Security, and Peace of Mind for all!